A portable, everything-proof speaker for all any environment. The XPEDITION 4 features dual 4" woofers and 1" tweeters powered by 200W of vibrant peak power and explosive bass. Go harder with the bass and switch onto BEAST mode to put your woofers into overdrive without distortion. Link a second XPEDITION 4 to create a stereo pair and bring on even more bass. Its IP67 rating means it is waterproof, dirt proof and shockproof. Not only that, but it is designed to float on water in a position where the woofers and tweeters are above the water. The speaker remains H2O protected, taking on full submersion in one-meter water for up to 30 minutes. The super durable cabinet also protects the unit from dirt, dust and debris, making it perfect for all types of rugged environments. The lightweight XPEDITION 4 has a sturdy carry strap and integrated handles, letting you bring the party everywhere and charges from a DC power source so the party can last for up to 24 hours on a single charge. The built-in Bluetooth with NFC pairing makes streaming music from mobile devices simple. 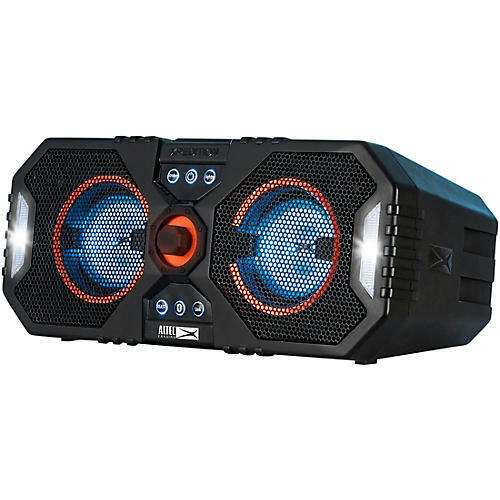 Additionally, the speaker allows you to move the party from daytime to nighttime with its 12 multi-colored dynamic LED light show that moves to the beat of the music.